In the joint statement following Prime Minister Abbott and Prime Minister Abe’s meeting, titled ‘Special Strategic Partnership for the 21st Century ’, one of the action items listed was tasking officials to develop a ‘coordinated strategy to strengthen cooperation in the Pacific region, commencing with consultations to identify priorities’. The two leaders stated that the strategy would ‘support economic prosperity, peace and stability in the Pacific region’. To get the ball rolling, both countries should now be talking about cooperation on maritime security in the South Pacific. The timing couldn’t be better. It’d not only build on the goodwill from the Abe visit but also on changes to Japan’s aid policy that could strengthen defence and security cooperation. Late last month, recommendations for changes to Japan’s Official Development Assistance (ODA) policy were sent to the Minister for Foreign Affairs by an expert committee. The committee suggested relaxing the ODA ban on military-related projects, arguing that, as military capacity can assist in non-military areas , such as disaster relief, Japan shouldn’t exclude all military activities from its ODA. Australia should now be working with Japan on the Australian Pacific Patrol Boat replacement program. It’s now, and will remain in the future, the central component of our defence cooperation program in the Pacific islands region. Twenty-two boats have been given to 12 island countries. But the fleet is now approaching its end of service. The Australian government has recently decided  to continue the Pacific Patrol Boat program within a different framework and has just approved almost $600 million in purchase costs and $1.38 billion in sustainment and personnel costs over the next thirty years. Timor-Leste is to be added to the new program, with Defence being lead agency on the project. As I’ve argued before  (with Sam Bateman), the Pacific Patrol Boat project isn’t really about supporting warfighting missions: its aim is to provide capabilities for good order at sea in the region. But if the recommended changes to Japan’s ODA policy flow through, that would mean the JMSDF might be able to cooperate with the three countries that run their Pacific patrol boats as part of a military force (Fiji, Tonga and PNG). In all those countries (and the other island countries where the boats are under police control), they’re focused on fisheries surveillance, disaster relief and search and rescue. Japan is already working on maritime capacity-building in Micronesia , with the initiative of two NGOs, the Nippon Foundation and Sasakawa Peace Foundation. They’ve provided small boats to several Micronesian islands, with Japan’s Coast Guard also assisting in capacity building. And Japan has been willing to cooperate there with RAN maritime advisers in Micronesia. Apart from the Micronesian project, Japan has also been supplying patrol boats to both the Philippines and Vietnam. It was even instrumental in getting the Vietnamese to separate  their Coast Guard from the military to facilitate that assistance. There are opportunities to work closely on Pacific maritime security not only with MSDF, but also with Japan’s Coast Guard and its Fisheries Agency. Indeed, we could encourage Japan to become part of Quad arrangements, where we coordinate surveillance patrols and flights in the Pacific with New Zealand, France and the US. There’s no reason why we couldn’t consider inviting China into cooperative Pacific maritime security arrangements as well as Japan. Protecting the marine living resources of the region and strong Pacific oceans governance should be a common goal of all the major players of the region. Let’s talk to our quad partners about rebadging the arrangement as a hexagon, engaging both Japan and China. Anthony Bergin is deputy director of ASPI. 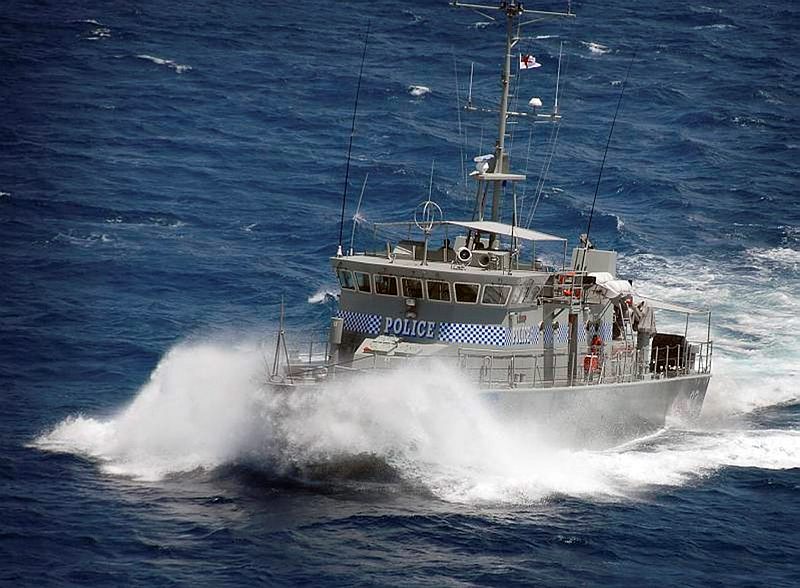 Image courtesy of Department of Defence .